Sojourn in this land and I will be with thee and will bless thee. Steve Armstrong is the president of Christian Information Center, Inc, and the founding director of Sojourn Mountaineering International. With years of experience working with people as a minister; in living rooms, auditoriums, classrooms, as well as the outdoors, he brings know how to the Sojourn program. Beginning in Spokane, Washington in the early 1970's, with the Spokane Mountaineers, he has learned mountaineering and outdoor skills and has been able to share his knowledge in many parts of the world. A former member of the American Alpine Club, Alaska section, former co-director of L.E.A.D. Outdoor Academy in Colorado and New Mexico, hunting guide in Alaska, New Mexico, and Colorado - these and other associations have given Steve lots to teach. Beginning with his own children in 1997 in Eastern Washington, Steve initiated a program to teach mountaineering skills and provide wilderness adventure to young people. From that beginning, Sojourn has grown. Steve currently lives in Spokane, Washington with his wife Kathy. Donnie Lamb is vice-president of CIC Inc. He graduated from the 9th Way Corps in 1981 and was ordained to the Christian ministry in August 1983. From the mid 1970's until today, his aim has been to help those that seek to learn more about God, His son Jesus Christ and to manifest the promises of God. He has been married to his lovely wife Marcia for 33 years and has 3 children; Murphy, Carli, and Philip. Donnie participated in the L.E.A.D. Outdoor Academy on several occasions in the late 1970's and early 1980's. He also served on staff with Steve Armstrong on numerous outdoor sessions in Oklahoma and Arkansas in the late 1990's and early 2000's. Donnie and Marcia currently reside in Spokane, Washington. Mark Dryden has been a student of the outdoors since youth. 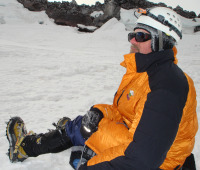 His climbing and hiking experiences run from Yosemite Valley to Mount Rainier and he has been with Sojourn Mountaineering since its first advanced session in 2001. 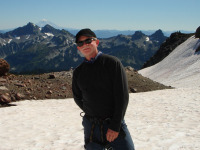 Mark has enjoyed exploring and laying the groundwork for new Sojourn adventures in the Northwest. He is currently pursuing backcountry horsemanship with his family from their ranch in Idaho. The steps of a good man are ordered by the Lord: and he delighteth in his way. Though he fall, he shall not be utterly cast down: for the Lord upholdeth him with his hand. I have been young, and now am old; yet have I not seen the righteous forsaken, nor his seed begging bread. Jessi Jaynes has been involved with Sojourn Mountaineering since it started in 1997 as a family endeavor. Since then she has helped students on sessions in New Mexico, Oklahoma, Southern Idaho, Northern Idaho, Oregon, British Columbia, and Washington. Jessi has a passion for adventure and travel that has taken her to England, France, Italy, the Middle East, Canada, and Chile. For the past several years she has been the food coordinator for the advanced mountaineering sessions which has been stimulating and rewarding. She’ll keep you regular in the woods! But most importantly being able to teach God’s Word in His wilderness is Jessi’s most beloved aspect of being on Sojourn staff. 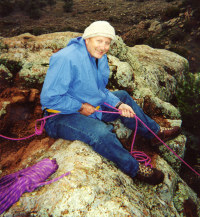 William Armstrong has been involved in outdoor activities, including rock climbing and mountaineering for most of his 23 years. Born in Oklahoma, he has traveled in the United States, Australia, New Zealand, Hawaii, Canada, and Mexico. He joined the Sojourn team in 1997, and has contributed his experience and leadership in most Sojourn events. He is currently living in Otis Orchards, Washington in a Christian leadership home called Iron House. This program teaches young men and women believing, self reliance, and the compassion of Jesus Christ. This is the second year of the program, and Will's second year as the physical coordinator of Iron House. Will owns a successful landscaping company called Team Landscaping, and has completed jobs in Washington, Idaho, and Montana. He loves God, his wife Michelle, and his dog Sunny. Timothy Armstrong, 20, is from Spokane, Washington. He is currently the spiritual coordinator of the Iron House program, 2008-2009. Tim has received training in mountaineering and rock craft by his father, Steve, who is the director of Sojourn. Since the program began in 1997, Tim has participated in most events offered by the program. He has climbed in Washington, Idaho, and New Mexico and served in leadership on most sessions. Currently, Tim serves as a co caption of the Community Colleges of Spokane Track and Field team, and specializes in the decathlon. He is CPR certified and brings great physical strength and wisdom to the Sojourn program. He also is a semi profession pizza delivery driver! 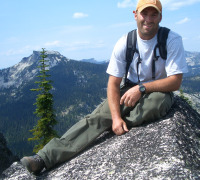 Aaron Barton has been a staff member of Sojourn Mountaineering since 2003. He is certified in first aid and CPR. 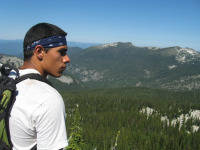 Aaron's love of the wilderness is evident in his avid exploring of the outdoors including multiple solo trips in the Sawtooth Mountains of central Idaho. He has ventured with Sojourn Mountaineering into New Mexico, Hell's Canyon, Oklahoma, and multiple locations in Washington, Idaho, and Canada. Aaron, along with his beautiful wife Amy, runs a weekly bible fellowship at their home in Spokane, Washington. Samuel Hale, 20, is from Spokane, Washington; but his family roots are in the three affiliated tribes of North Dakota, (Mandan, Hidasta, and Arikara Nations). Sam is proud to be a Native American and loves to share God's Word with His people. Sam is co captain of the Community Colleges of Spokane Track and Field Team, with a specialty in decathlon. A member of Iron House 2008-2009, he brings leadership and physicality to every thing he does. He has climbed with Sojourn Mountaineering in New Mexico, North Idaho, and Washington. Michael Jaynes, 22, from the great state of Maine, was a member of the 2008-2009 Iron House program. In 2008, after he and his father built a house together, Michael began a journey to learn to walk better with God. His travels took him to North Carolina, Washington DC, Indiana, the Black Hills of the Dakotas, and Montana. On his way to Alaska (or so he thought), he stopped in Spokane, Washington where he joined Iron House and Sojourn Mountaineering, and where he met Jessi Armstrong. This spring Michael is looking forward to marrying the love of his life, Jessi Cole Armstrong. 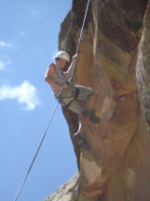 As a staff member he brings years of experience of hiking, camping, and climbing rock and ice. 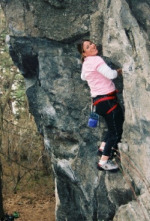 Amy Barton has been a part of the Sojourn Mountaineering staff since 2006. Amy has enjoyed many treks to the Selkirk Mountains of Northern Idaho, hiked the trails of Hell's Canyon, and learned to believe God for the hand and foot holds needed on many climbs. While summiting peaks in the Selkirk Mountains, Amy often remembers the verse, He maketh my feet like hinds' feet, and setteth me upon my high places. Psalm 18:33. Amy thanks God daily for the blessings of her husband and son and the chance to know such great believers in the Sojourn Mountaineering program.